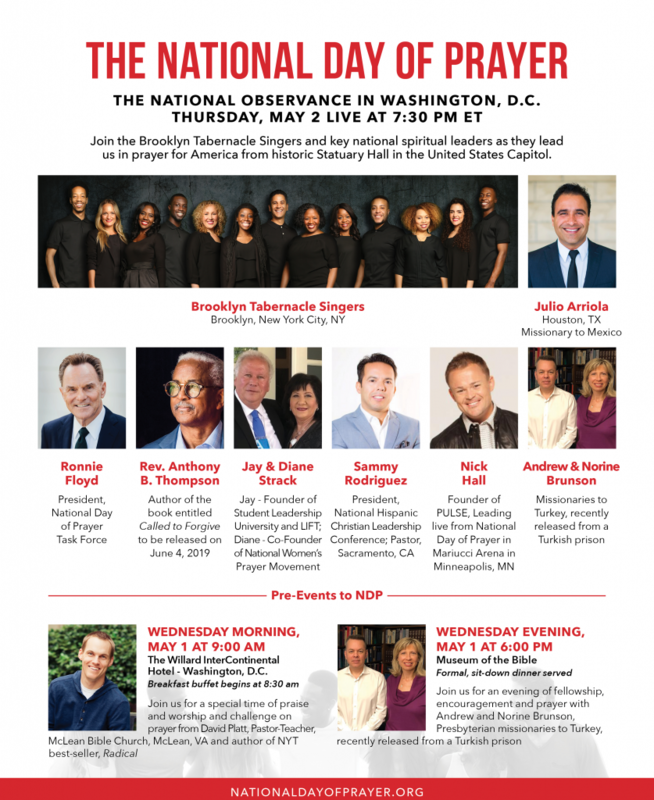 Each observance of the National Day of Prayer on May 2 is important and each one is supported in prayer by its organizers and our entire volunteer force. But, the National Observance of the National Day of Prayer on Thursday, May 2 needs to be prayed for diligently and continually. Last year’s observance in Washington, DC, in National Statuary Hall in the United States Capitol Building, has been viewed over one million times on Facebook alone. To God’s glory, that is one million people impacted by the prayers of God’s people. This year, we pray the favor of the Lord upon this gathering in an even greater way. From this esteemed setting in the United States Capitol Building, this two-hour prayer service for America can be viewed on Facebook Live, streamed live from our website, and it will be broadcast around the entire world through DayStar Television Network, God TV, and Brio TV. It will also be heard via numerous radio stations around America. We encourage you to support and attend a prayer observance in your local area, whether it is during the day or evening. If you attend a daytime observance, invite others to join you in watching the National Observance that evening. Dr. Ronnie Floyd is the Senior Pastor of Cross Church, President of the National Day of Prayer, & Past President of the Southern Baptist Convention. This past Sunday morning in all eleven services on the four campuses of Cross Church, I submitted my resignation as your Senior Pastor. For the past thirty-two and one-half years, you have given me the highest honor to serve you in this capacity and live life with you here in Northwest Arkansas. If you missed this historic Sunday, which was both painful and powerful for all of us, you can watch the message in its full version from our Pinnacle Hills Campus or you can watch the final few minutes only with the conclusion and resignation. Share with friends and family across the world. I want others to know a pastor and church can truly love one another and experience their greatest years together as pastor and people. I love you, Cross Church, and one thousand thank yous for loving our family. My final sermon and Sunday with you as Senior Pastor will be Sunday, May 19. Between now and May 19, I will be leading and preaching every weekend at Cross Church, as I have all these years. Until I hand the baton over to your next Senior Pastor following my final message with you on Sunday, May 19, I will be leading and investing in our church, preparing for all going on now and moving us forward to the summer, the fall, and beyond. As I stated Sunday, with the coming National Day of Prayer on May 2 and the Southern Baptist Convention on June 11-12 and all the pre-convention days before, I have much going on; therefore, during the week, I may be from Washington to Nashville to other cities preparing, but will mostly be here, as I have been. Please pray for me. I will give the best I have here in the days I have together with you. On Monday when I drove up to the Springdale Campus, I lost it again emotionally as I did Sunday, knowing soon my time with you will end. I know God will see me through, but there is a part of me that will never leave you. Pray for Jeana and me daily. We really do need it. This past Sunday, toward the end of my message, before the conclusion and resignation, I gave you an important announcement about the succession plan announcement that will occur this Sunday, and the importance of April 28 for our church’s future. You can watch this brief segment here. The video announcement relating to succession will occur in each of our services on Sunday. Following two weeks of intensive prayer, on April 28 in each service, our Board of Directors is asking you to vote for and affirm whom they believe by God’s divine purpose, preparation, and will to be the man God is raising up to be the next Senior Pastor of Cross Church. If this occurs, then my final days with you will be preparing all of us, including him, to take the spiritual entrustment of leadership once I complete my final sermon on May 19. It is my desire and the desire of our church’s leadership that there will never be even one moment when Cross Church will not have a Senior Pastor providing spiritual leadership and direction for our Cross Church family. Prayerfully, it will be one of the most powerful God moments as we prepare to enter the 150th year of Cross Church. MY LIVING HOPE is our incredible theme for this coming Easter Weekend. It will be a grand and powerful day. Due to our number of services and at times occurring back to back, our goal is each service will last an estimated 65 minutes. Friends, please ask yourself: Who’s Your One? Please use invite cards or even email or text invites you can get here. As we have prepared for this weekend, we believe it will be our greatest Easter in our entire history. It should be, as we are right now experiencing our greatest year ever, and even last week almost broke the 10,000-person per week goal we have set before us to average by the end of the year 2020. Therefore, Easter should be very special. Let’s pray for hundreds to come to Christ. Emotions flood my heart as I even think about this being my final Easter weekend with you as Senior Pastor. It is always one of my favorite weekends of the year. Ronnie Floyd. All Rights Reserved.